Once a month many talented persons gather at Artistic Artifacts in Alexandria, VA. Part of the meeting is show and tell of new work. We also exchange ATCs, (2.5″ x 3.5″ artist trading cards) before the meeting. This month’s ATCs use the stitch and slash technique I found here. It was fun and a good way to use some of the fabric pieces I’ve collected. Categories: Blog | Tags: artist trading cards, artistic artifacts, atcs, fabric, Mixed Media, stitch and slash | Permalink. 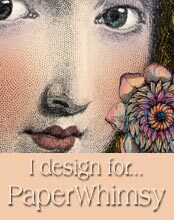 Categories: Blog | Tags: artistic artifacts, circus paper doll, Mixed Media, paper doll | Permalink. Here is some of the wonderful work of my students from the most recent eye token class held at Artistic Artifacts in Alexandria VA. My next class there will be in July and is art paper dolls. If you would like to make a lover’s eye of your own, the forms are available from paperwhimsy.com. The eye collage sheet is here. Categories: Blog | Tags: artistic artifacts, collage, collage sheets, lovers eye token, Mixed Media, mixed media class, paperwhimsy | Permalink.